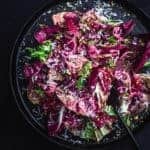 It’s a marvelously magenta blood orange and fresh fennel salad with a complex range of bitter, sweet, salty and tangy flavors that can brighten up even the greyest of winter days! 1 tablespoons champagne vinaigrette (add more to taste. Exact quantity will depend on how much of that blood orange juice you manage to get). Segment the blood oranges, squeezing every last drop of that blood orange juice out as well. Whisk together the blood orange juice, honey, vinegar, olive oil, salt and pepper. Thinly slice the shallots and marinade in the vinaigrette while you prepare the rest of the ingredients. Ideally, the can chill in the vinaigrette at least 20 minutes. Thinly slice the fennel, preferably on a mandolin if you have one. Wash & dry chicory leaves. Toss them with 2-3 tablespoons of vinaigrette to coat them lightly. Spread on a platter or divide among 4 shallow bowls. Scatter with fennel, citrus, pistachios, cheese and mint. Drizzle with a little more dressing and sprinkle with a bit of flaky sea salt and black pepper. Enjoy right away. Pick oranges that are firm to the touch and feel heavy for their size. How to segment citrus: cut the top and bottom off so the citrus sits flat, cut the skin deep enough off to expose the flesh and carefully cut out the segments from the membrane, holding the fruit over a bowl to catch the juices (and use for the vinaigrette). Any kind of chicories (or a combo) works! If you have a mandolin, now is the time to use it! Slice that fennel nice and thin.